The cap on public sector pay rises in England and Wales is to be lifted. Ministers will now get “flexibility” to breach the longstanding 1% limit. The announcement came as the government said police officers would get a 1% rise plus a 1% bonus, with prison officers getting a 1.7% rise – both funded from existing budgets. Unions reacted angrily to the pay awards, branding them a real-terms cut, and the Prison Officers Association threatened industrial action. 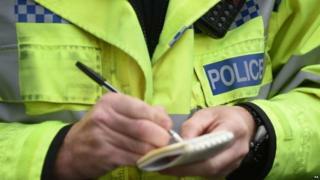 There was also a warning from police chiefs that making forces pay for the increase themselves would put “financial pressure on already stretched budgets”. Public sector pay was frozen for two years in 2010, except for those earning less than £21,000 a year, and since 2013, rises have been capped at 1% – below the rate of inflation. 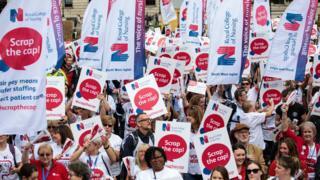 There has been speculation in recent weeks the cap could be lifted in response to worries about its impact on staff recruitment and retention and morale in the public sector. Announcing the increases for police and prison officers, Chief Secretary to the Treasury Elizabeth Truss said “now is a time to move to a more flexible approach” to public sector pay. She told BBC Radio 4’s The World at One review bodies and departments were being given greater leeway to use pay to address “pinch points” within public sector staffing. “We are making sure that our policy is targeted to where there are specific issues, where we need to make sure we recruit more talent into the public sector, but also where we do need to make sure that we are holding on to those really valued people,” she said. The higher increases for rank-and-file police and prison officers, which are backdated to 1 September and 1 April respectively, are based on the most recent recommendations of independent pay review bodies. Since the general election, Theresa May has been under pressure to respond to voter concerns over squeezed living standards. And today’s announcements on pay for police and prison officers mark the beginning of the end for the public sector pay cap. But if the government thought breaching its own pay cap would ease tensions with the trade unions it will need to think again. At the TUC conference there was anger and disappointment. The biggest union, Unite, threatened to press ahead with strike action even if their ballot turnout and margins don’t meet levels now required by law. While there was very little support for talk of calling illegal strikes, legal action could be on the horizon. If the unions don’t get a commitment from the chancellor in November’s Budget to fund larger pay increases next year we should expect the prospect of strikes in the new year. Although next year’s pay settlements for other parts of the public sector, such as the NHS, have yet to be decided, a No 10 spokesman confirmed the existing pay cap was at an end. The newly-announced rises are still below the level of inflation, which measured by the Consumer Prices Index rose to 2.9%, from 2.6%, in August. Steve White, chairman of the Police Federation of England and Wales, said the announcement would leave many officers “angry and deflated”. The federation had asked for a 2.8% increase to basic pay, while the Prison Officers Association had called for a 5% increase. The government has decided to lift the 1% pay cap on the public sector, although at the moment we don’t know by how much, except for the police and prison officers. How much it would cost is a tricky question. In the case of the police and prison officers, the money is apparently coming from existing budgets, but that means that there will have to be cuts elsewhere or reserves will be run down. The Institute for Fiscal Studies reckons that an extra 1% pay for the entire public sector would cost about £1.8bn a year, although it would get some of that back in income tax and National Insurance. But there are other savings that need to be taken into account, for example, some have argued that raising pay in the NHS would stop staff leaving and reduce absence, so reducing the use of more expensive agency staff and saving money. Chief Constable Francis Habgood, of the National Police Chiefs’ Council, said forces had budgeted in line with the 1% cap until 2020, adding that without extra government funding the latest award would “inevitably impact on our ability to deliver policing services and maintain staffing levels”. This was rejected by Policing Minister Nick Hurd, who said the offer was affordable to forces. He added that police forces were “sitting on” at least £1.5bn in reserves. Responding to the announcement, TUC general secretary Frances O’Grady said “this below-inflation pay offer is pathetic”. Speaking at the TUC conference in Brighton, Labour leader Jeremy Corbyn accused ministers of playing “divide and rule” with different parts of the public sector. Unison said it was a “tiny step in the right direction but not nearly enough”. Chancellor Philip Hammond had been expected to address the issue in his Autumn Budget amid calls from Labour, and some Tory MPs, for help for million of workers who have suffered years of real-terms pay cuts. As the latest announcements are being funded through existing budgets, they will bring no extra funding for the devolved administrations, who have the power to set their own rates of public sector pay. Last month, Scottish First Minister Nicola Sturgeon announced the 1% cap would be scrapped from next year. Liberal Democrat leader Sir Vince Cable said the pay cap was “no longer sustainable”, calling for it to be “lifted across the board”.